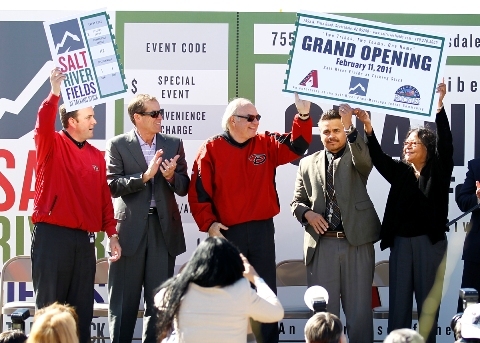 In a short ceremony on Friday, officials from both the Arizona Diamondbacks and Colorado Rockies along with leaders of the Salt River Pima Maricopa Community dedicated Salt River Fields at Talking Stick. The event featured several key speakers including President Diane Enos who thanked the many contributors, and welcomed everyone to the complex. Kendrick was just one of the speakers who stressed the importance of the relationship between the two teams and the Community. D-backs President and CEO Derrick Hall followed Kendrick and spoke of his outstanding relationship with late Rockies President Keli McGregor. Prior to the grand opening, the Keli McGregor Reflection Trail was dedicated. The trail is located outside of the main stadium and behind home plate, and is in honor of the late Rockies President who passed away in 2010. It was an emotional time for members of the D-backs and Rockies organization, and for McGregor’s wife Lori, who represented her husband. Hall remains proud of what he and McGregor envisioned for the Spring Training complex. Salt River Fields at Talking Stick is a one of a kind facility equipped with the largest video board in the Cactus League, 12 practice fields, and an elaborate stadium. Hall is confident that fans will be impressed when they attend games. The action at Salt River Fields will begin to pick up next week when pitchers and catchers hold their first workout on Monday. The first game of the Spring Training season will come on Saturday, Feb. 26 between the D-backs and Rockies.